In this article I will review PaperStyle wedding invitations along with the pros & cons of how to buy stationery or other personalized wedding products from them. From modern to traditional invites, you can find custom wedding invitations that will fit your taste and style. Although they started out in print products, PaperStyle has branched out over the years into other product lines such as napkins, party supplies, tableware, and other gifts. As you can see from a screenshot of their homepage, they also offer stationery products for holidays, babies, business, and announcements. The website design is well done for the amount of information displayed on the homepage. From an online consumer standpoint, I like that you can clearly see in the top left corner that they offer fast and free ground shipping on US orders $50 and over. In addition, they make liberal use of a toll free number and live chat customer service right above the search bar in the main header. The main menu navigation bar packs 11 categories along with extended menus. When you move your mouse and highlight weddings on the main navigation, you are able to see a whole list of product categories: shower events, pre-wedding events, invitations, accessories, designer invites, on the day and more. Certainly a lot of great offerings to spend time browsing. 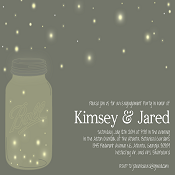 has a generous 555 wedding invitations available in styles such as elegant, engraved, letterpress, and whimsical. What stands out for me is the luxurious designer invitation choices. I will warn you that some of the more expensive designer invitations have price tags upwards of $34 PER INVITATION. What do you expect from an engraved gold edged invitation? The majority of wedding invitations offered are priced at the high end of the online stationery market and come with embellishments, ribbon, or other accessorized glam. 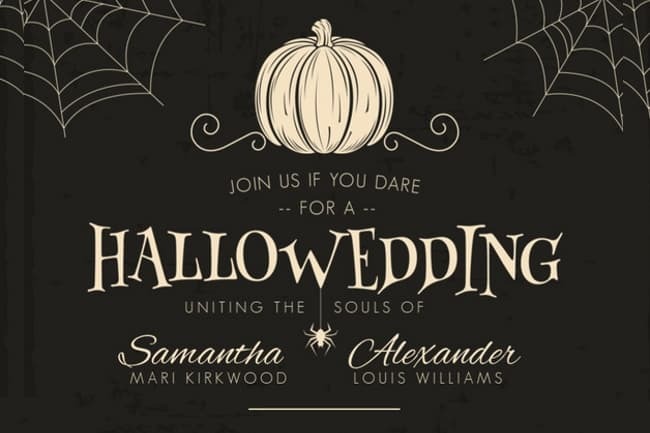 If you want to buy super elegant invitations (with a price to match), take a look and you may just find something that really catches your fancy! 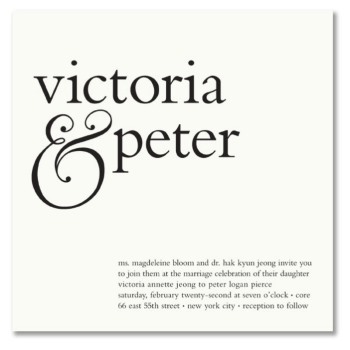 Two designs that I love are this square, minimalist design by Vera Wang below and a uniquely colored peacock gatefold invite with ribbon. I suppose you really have to imagine the raised print feel on your fingertips to fully appreciate the square designed invite. Let’s take a look at the selection and ordering processes to see how easy it is to order stationery from PaperStyle. We will continue with the Vera Wang square design from above. 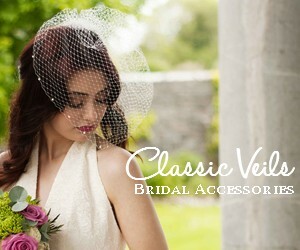 A huge amount of filter options will help you to narrow down an invitation that is right for you. As you can see below, you are presented with option to filter based on category, designer, color, # of photos, shape, format, style and size. 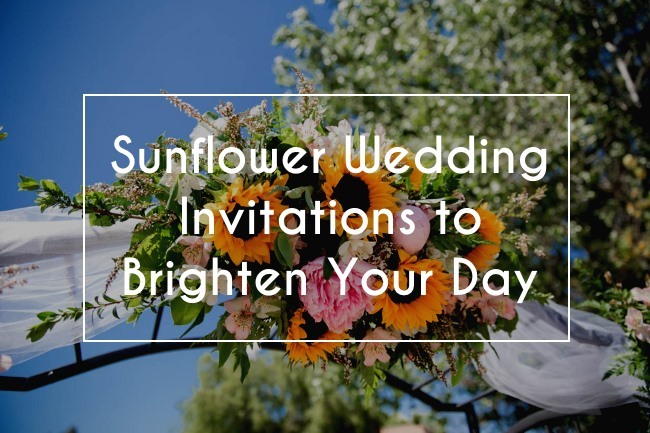 For those who already have an invitation style/design in mind, the filter options will allow you to quickly narrow down the list from over 550 to a more manageable number from which to peruse. Once you’ve found a swoon worthy design, click on it and you will be able to start the personalization process. The individual invitation page is a little busy with many competing offers for your attention. I would have liked to see more use of color to distinguish what to do next in the order process. Lots of text information tells me that because of the invitation’s size, ‘extra postage required for mailing‘, and that a free E-proof is included. Overall, go through each of the drop-down menus on the right hand side. First select how many invitations you want to buy for your wedding. Then choose your envelope option, which defaults to blank (matching) for free. You can also add matching items like a thank you card from this page before proceeding to the personalize screen. 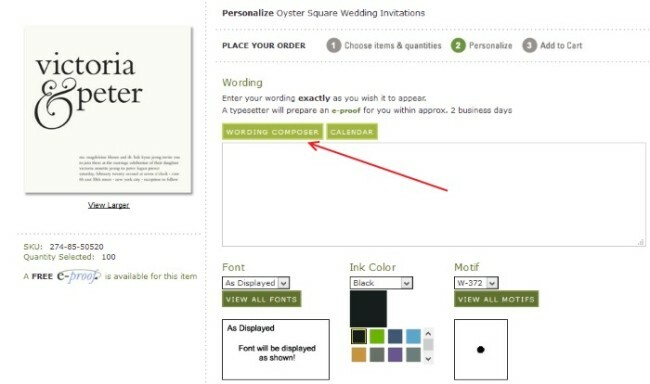 Paper – for the example invitation above, there is no option to select paper because the paper type is already chosen based on the luxury design. Other invitations may have an option to select a paper type upgrade from the default signature matte (120 lb). Order A Sample – A sample will cost a small fee from PaperStyle, but may be worth it to ensure that you like the product quality before you buy your entire suite. The second step in the order process for designer stationery is to personalize your invitation. I like the unique wording composer functionality that PaperStyle has built. 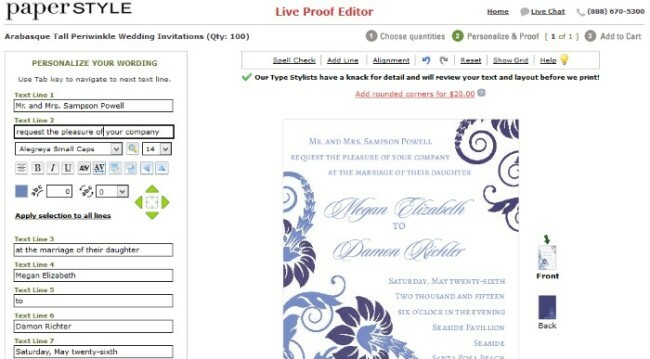 Simply click the green wording composer button and another box will popup to guide you in entering all the personal information for your invitation. Once finished, click select this wording and your information will be populated into the on screen box. A great additional design feature in my opinion. When you apply changes, there is no automatic preview function. However, you will receive a FREE e-proof within 2 business days to make sure that everything is as you envisioned for your stationery. The live preview and word editing function is built into other stationery offerings from PaperStyle. As you can see below, certain types of stationery allow you to edit the color, font, or style for each line of your stationery item. A real time update will let you know how it looks. BONUS TIP: We played around with the above editing and absolutely LOVE one feature that we came across! You can actually drag any line of text and reposition it within the margins of the stationery you are editing. Superb functionality for those who want to spend the time to fine tune every aspect of their invitation or other wedding stationery. Back of Invitations – In the above image, you can also add and edit text for the backside of the invitation. Another great (free) feature for those who want to add more information to the reverse side of their cards. The third step is to make sure everything looks good. In our example Vera Wang invite, we will receive a free e-proof of the design within 2 business days. In the second example (above) you are taken to a dedicated live proof editor where you can see both the front and back of your design. Don’t worry if you do happen to make a small mistake or edit error. PaperStyle has professional Type Stylists who will review and touch up your order for alignment and spacing before it prints. You must first create a free account with PaperStyle before you can checkout. Enter your personal information then proceed to shipping options and final payment. We like the style and variety of price points available from PaperStyle. 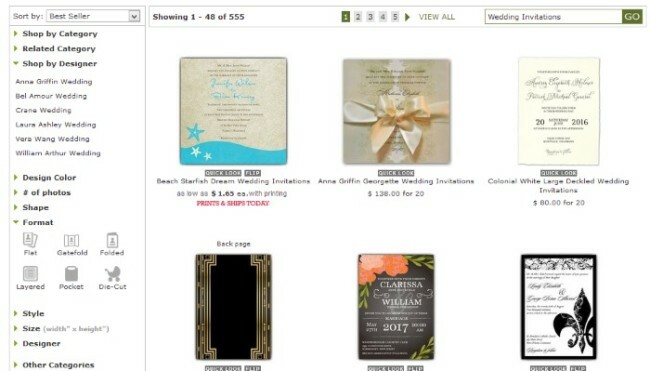 A quantity of 100 designer wedding invites can cost into the four figures. One of their most expensive designs from William Arthur will set you back $1255 for a quantity of 100. 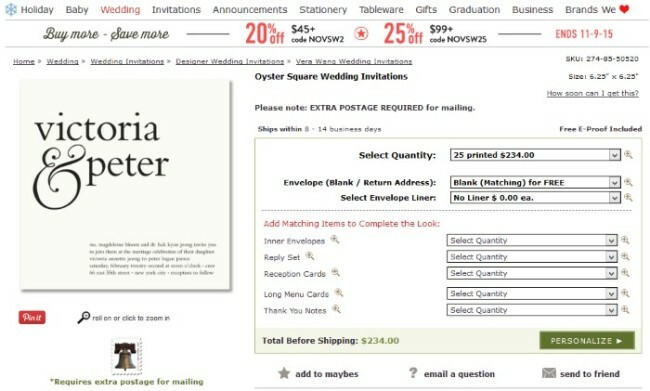 Our Vera Wang oyster square example from above cost $381 for 100. Of course, you can buy matching items or upgrades which will increase the price you pay. 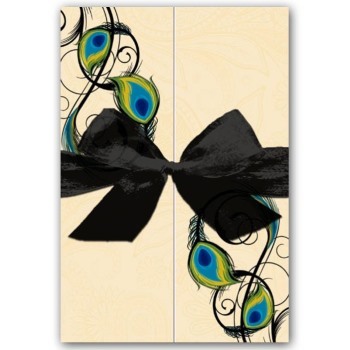 You can purchase lower priced options with quite nice designs for around $99 for 100 invites. 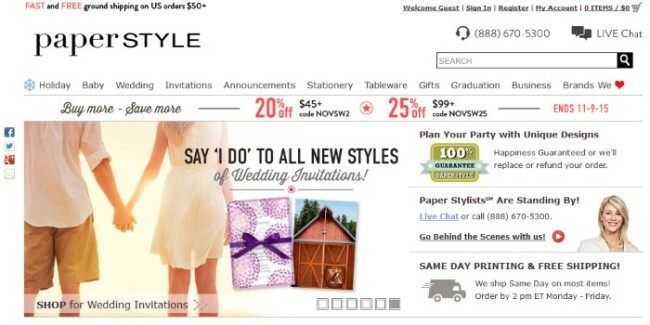 PaperStyle.com delivers a wonderful user experience, designer stationery names, and overall great value. Sure, they have some amazing luxury invitations that come with a hefty price tag, but they also have more affordable options if you desire. We love the functionality – second to none in terms of being able to fine tune your stationer design. A superb online stationery company. Maybe I’ll pick up a few of those gold guilt invites for my next party? !